Dr Emmanuel Mador was born at Butura, Plateau State. After completing a science course at Nakam Memorial Secondary School, he proceeded to the University of Jos where he obtained MBBS degree. After graduation, he practiced medicine at Jos University Teaching Hospital for a while before leaving for Centre for Reproductive Health Research as Medical Officer. Subsequently, he joined University of Jos as lecturer because of his quest for teaching and research. He obtained PhD in Anatomy in 2012 and was appointment by the Nigerian Federal Government in April, 2013, as member of the Board of management of National Institute of Medical Research, Yaba. Dr Mador was also appointed Chairman of the Visitation Panel to College of Health Technology, Zawan in August, 2014, by the Government of Plateau State. He commenced work as an Anatomist in 2000 focusing on Clinical Anthropologist and Molecular Embryology. Currently he is a Senior Lecturer and the Head of Department of Anatomy. He has published several peer reviewed articles in scientific journals. Christian Ogoegbunem Isichei is Founder and Coordinator of Faith Alive Foundation in Jos, Nigeria. He holds a Bachelor of Medicine/Bachelor of Surgery degree, a Master of Science degree in Clinical Biochemistry/Chemical Pathology and a Fellowship in Chemical Pathology from the National Postgraduate Medical College of Nigeria. In addition to his work at Faith Alive and at the Jos University Teaching hospital, he teaches undergraduate and postgraduate students/residents at both Bingham University in Jos and the University of Jos. He is happily married to Dr. Mercy Wakili Isichei and the marriage is blessed with three lovely children-Emily, Prince and Joseph. Dr Ishaya Chuwang Pam born 6th April 1964. MB.BS, 1986(University of Benin) FWACS 1997(Fellow of the West African College of Surgeons). An astute administrator, he was Acting Head of Dept of Ob/Gyn (2004-2005), Chief Medical Director, Jos University Teaching Hospital (2005-2013). He is currently an Honorary Consultant Obstetrician and Gynaecologist with JUT H. Senior Lecturer in the Faculty of Medical Sciences, University of Jos. Trained V.V.F surgeon. Examiner, West African College of Surgeons. Widely traveled and has attended training programs in the Harvard Medical School dept. of Continuing Education in association with the Levinson Institute at Bedford, Massachusetts U.S.A, Centre of Reproductive Medicine, University of Warwick U.K, Apollo Hospital Indraprasha, New Delhi among others. He is also widely published, contributing several chapters in books and over 30 articles in reputable journals. He is married with children. Hobbies include football and swimming. This book on the aetiology of preeclampsia-eclampsia has been written keeping in mind the findings of scientists who have researched on the aetiology of this disease which is exclusive to human pregnancy. Research efforts on identifying the cause of preeclampsia have traditionally been focused on subjects that have manifested the disease. Our experience has shown that the culprit that triggers the disease returns to hiding as soon as the disease begins to manifest. 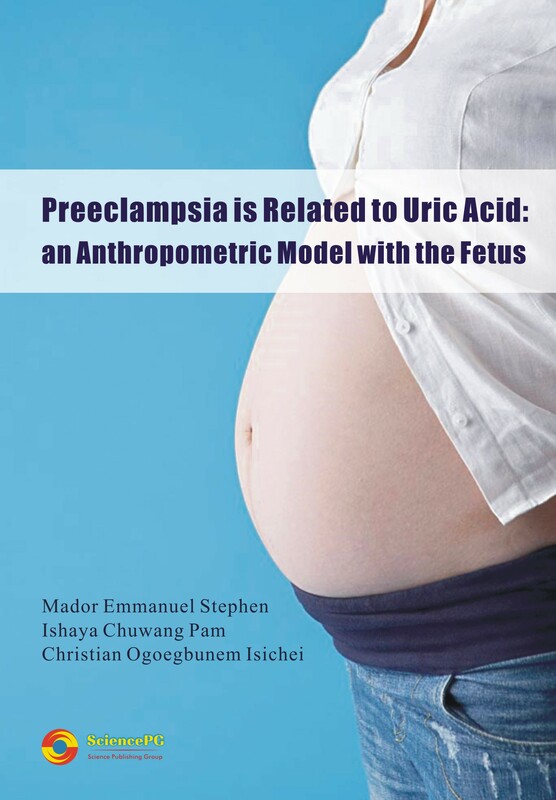 In this book care has been taken to ensure that the text provides all the information necessary for an intelligent understanding of uric acid as the cause of preeclampsia-eclampsia. At the same time, innovation has been used to make the subject easy to understand. In an endeavor of this sort it is to be expected that some errors of omission or commission are likely to creep in. To avert as many of these as possible a number of renowned scientists were requested to read through the text. Their suggestions have greatly added to the accuracy and usefulness of this book. Nevertheless, there is still room for further improvement and the authors would welcome suggestions to this end both from researchers and clinicians.